A little necklace of a bezel set cabochon. Each pendant is 5mm (about 1/4" inch) and available in sterling silver or 14k gold filled. The necklace is available from 16" - 20" inch length. 14K gold filled necklace of a small faceted stone and pearls on open link chain. Shown in Peruvian chalcedony. 14k Gold Filled necklace of chain and a large smooth briolette. 14k Gold Filled necklace of chain and large faceted gemstone briolette. 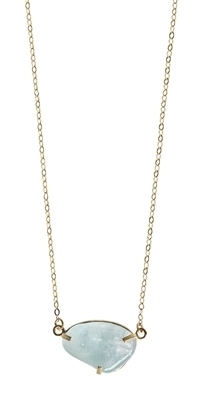 A faceted cushion cut stone on a open link 14k gold filled chain. A necklace of a faceted natural gemstone briolette and faceted beads on an open link 14k gold filled chain. Shown in Amethyst. 14K gold filled necklace with a prong set gemstone. 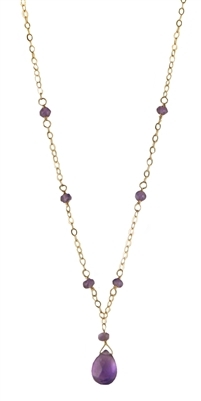 Sterling silver necklace of a gemstone cabochon on a blackened silver pendant and 14k gold filled chain. Shown in natural white opal. 14K gold filled necklace of a prong set natural aquamarine. A necklace of blackened sterling silver, solid opals and 14k gold filled chain.